The central warship of the Messiah 13 aliens, who hail from the third planet of the Yomi system, the Daimakan was a mobile war fleet. Equipped with immense armament and housing 75 Hell Fighters inside, the ship traveled the immense 22,000 light year distance between the alien home world and the Milky Way galaxy. 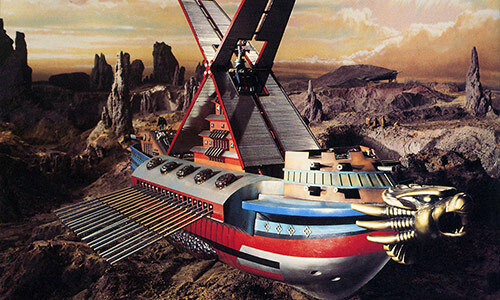 The extraterrestrial beings set up Venus as their temporary base, as they planned to conquer Earth. For the alien's first attack, the Daimakan, positioned in the blackness of space, launched a legion of Hell Fighters toward the Earth. The first signs of the attack were gradual, with electric wave interference and a "comet scare". By Autumn of 1988, the disturbance was hard to ignore as America and other locations stopped space shuttle travel due to the electro-interference. These finally gave away to scattered sightings of UFOs, with most reports originating from the United States, and data to indicate some of the comets had "touched down" on Earth. 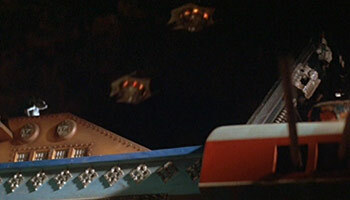 The first overt act of war from the aliens came from the Daimakan itself, breaking the cloak and dagger campaign. With the Space Station Terra orbiting Earth, the Messiah 13 warship attacked it. 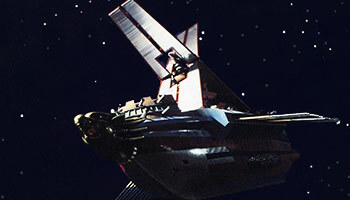 While in communication with the Japanese branch of the UN Space Federation, the Daimakan destroyed the orbiting space station, but not before the crew was able to notify Earth that a huge "Roman ship" was approaching. Following the destruction of Space Station Terra, the Daimakan stationed itself on Venus and acted as a central base to the assault. As the aliens learned of the Goten, getting access to it became their number one priority. Ultimately, the invaders failed and the Hell Fighters on Earth were destroyed by the Goten. With the local alien forces defeated, the Goten set course for Venus. Along the way, the craft came into contact with a destroyed piece of the Space Station Terra. Despite signs of something being wrong, as the wreckage was far away from Earth where the Daimakan had attacked it, the crew explored the debris and brought aboard the body of one of the fallen station members. Unfortunately for the crew of the Goten, the incident was orchestrated by the Messiah 13 aliens and the fallen station member was one of their soldiers in disguise. Kidnapping Jun Takigawa, daughter of Goten captain Masato Takigawa, the aliens brought her aboard the Daimakan back on Venus. Sending an electro-wave signal, the Hell Commander, leader of the Messiah 13 aliens, taunted the Goten crew and warned that further action would leave the drill tipped ship "drenched in blood." Ignoring the threat, the Goten touched down on Venus about six kilometers away from the alien's warship. Wanting to gather reconnaissance first, they sent out the Land Rover to investigate the Daimakan. Stationed below a cliff, the Daimakan was shielded using its barrier generator as the Land Rover approached. The Messiah 13 warship, however, sensed the small craft even despite it hiding in a ravine. Hoping to strike quickly, the barrier was briefly removed so it could unleash a volley of shots from 18 of its Vice Cannons. The Land Rover narrowly escaped. Surveying the Messiah 13 warship, and planning to enter through the air duct-like "mouth", the Goten crew started their attack. Unleashing a wave of Space Fighters, the ships attempted to destroy the cliff above the Daimakan while direct attacks were deflected by the barrier. Retaliating, the aliens unleashed a wave of Hell Fighters as the barrier was briefly removed on the Daimakan before being generated again. 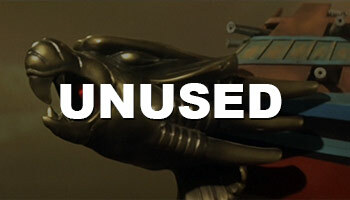 While the attack ships exchanged fire, one of the Space Fighters was destroyed and crashed into the cliff, causing it to collapse on top of the Daimakan. While the alien warship was not damaged by the collapse, the barrier had been removed by the incident. Seeing an opening, a small attack team from the Goten entered the Daimakan through the "mouth-like" area of the craft. Once aboard the alien craft, the team discovered a variety of security features. This included electromagnetic barriers contained in cages, capable of destroying a knife that the barrier was tested against. The aliens themselves patrolled the craft extensively as well, both out in the open and also through gun holes found in wall statues in the shape of the Hell Commander. Suffering early casualties, the remaining two members of the attack team stormed what appeared to be the central power area of the ship. However, the Messiah 13 aliens quickly ascend on them, killing one and throwing the other, along with Jun, in a jail cell. Sending an elctro-wave communication to the Goten, the Hell Commander informs captain Takigawa of the events, asking for his surrender. The captain refuses. 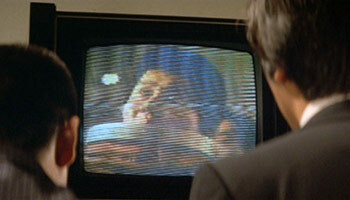 Before the Messiah 13 aliens can retaliate, though, Jun exploits the hexagon computer controls of the Daimakan to escape. Together with the other captive, the pair drive back toward the Goten via a parked Land Rover outside. Ready to strike back, the Daimakan extends its multi-dimensional stabilizer and takes flight. Its first action is to shoot down the last of the Space Fighters, prompting the Goten to take flight as well. The two giant warships exchange firepower, doing strafing runs against one another. The crafts seem evenly matched, with their weapons damaging but not stopping each other. A turning point is arrived, though, through a combination of the Goten's Revolver Beam followed by the use of its drill, which first knocks out 18 Vice Cannons and then the multi-dimensional stabilizer panels on the Daimakan. Sensing an opening, the Goten unleashes an all-out assault with its weapons, greatly damaging the Messiah 13 warship in the process. 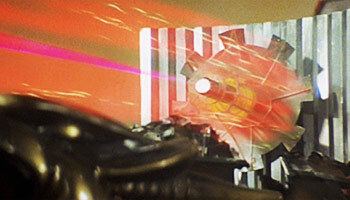 Responding in turn, the Daimakan unveils its Gravity Gun and quickly begins blasting the Goten. The powerful weapon tears into the ship, sending it crashing to Venus' surface below and turning the tides of the conflict. As a last resort, the Goten fires off its drill which contains inside it a powerful Ether Bomb. After unsuccessfully trying to fend it off with the Gravity Gun, the drill punctures a hole in the Daimakan and detonates. The blast sets off a series of explosions inside the Daimakan until the Ether Bomb takes full effect and destroys not only the warship but all of Venus along with it. The craft can fly at an incredible speed of 30 kilometers per second, which roughly translates to a flight speed of around mach 87.5. The craft is aided by a multi-dimensional stabilizer for its flight. This is located at the top of the craft and appearing like two panels, with the ability to fold them in. However, they are not required for flight, as the craft was able to stay airborne after the Goten destroyed the panels. While the ship can fly within an atmosphere, it was also built to cruise across space for extreme distances. 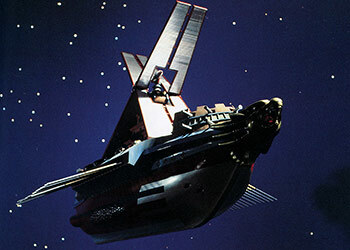 In fact, the Daimakan was constructed in a way that it could fly in space at maximum warp speed while still maintaining navigation capabilities. Although its speed of travel outside an atmosphere is unknown, it did travel the 22,000 light year distance between the alien's home planet and Earth. The Daimakan is a mobile war fleet. The large craft can house 75 Hell Fighters inside. When launched from the Daimakan, the Hell Fighters emerge from the rear of the craft. A decorative symbol, in the form of a gargoyle-like statue, is extended just before the fighters begin to depart. A total of 63 Hell Fighters are visibly destroyed during the initial conflict on Earth. An additional 16 fighters are seen on Venus. This exceeds the total amount that the Daimakan can store by 4. Consequently, it's possible the Messiah 13 aliens began to construct more after launching the initial attack on Earth. A total of 57 Vice Cannons are found all across the warship. The weaponry is located on all sides of the craft, including the front, back and both sides. There are a total of 9 Vice Cannons found on the bridge of the ship, with 4 more located at the base of the Daimakan. An additional 8 cannons are found on the stern of the craft in the rear. The bulk of the cannons are located on both sides of the ship, with the oar-like cannons located in groups of 18 on each side for a total of 36 cannons. Located toward the top of the space craft is a barrier generator. 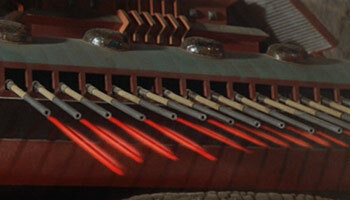 When activated, this surrounds the ship in a red barrier that resists and can even redirect energy fired at it. The barrier's effect works in both directions, requiring that the Daimakan lower the barrier before it can fire its own weapons to targets outside. Despite its energy durability, the barrier has limitations. 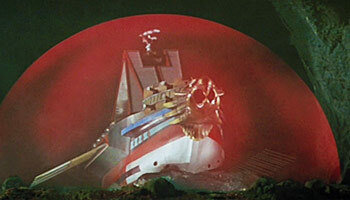 As a result, after the Space Fighters cause a cave-in on top of the Daimakan, the barrier is removed. Due to the fact that the barrier generator is located toward the top of the craft, it does require that the upper flaps of the multi-dimensional stabilizer be folded in. Consequently, it's restricted to ground use. The craft is able to emit electric wave interference across extreme lengths. Done at a frequency of 420 megahertz, the aliens used this to cause disturbances on Earth while they were still located around Venus. While this technique aided in compromising communication on Earth, it's actually a by-product of the Messiah 13 aliens communicating with each other. Utilizing this technology, they can send transmission signals in near real-time across the galaxy. This technology was also used to communicate with the Goten, to warn that they had kidnapped the captain's daughter. The warship was capable of firing a single, large blast from the deck of the ship. 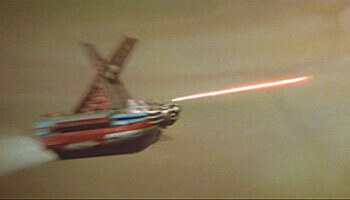 Rarely used, the Space Beam Cannon delivered the kill shot to Reikai Muroi's Space Fighter. The Daimakan's ultimate weapon. The Gravity Gun is located inside the bridge and rises up before being fired, unlike the other weapons of the craft that are already exposed. Unleashing gravitational waves, the cannon was able to quickly down the Goten after the rest of the Daimakan's arsenal proved unable to defeat it. Among the Daimakan's arsenal was a weapon called the Hell Missile. The craft was noted to have 64 shots of this attack, although didn't appear to utilize it during the warship's battle with the Goten. The original design for the Daimakan came from production designer Yasuyuki Inoue. 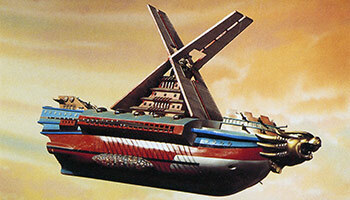 The original already featured a sailing-like design, but Minoru Kujirai added elements to make it look more like a Roman ship. This information was listed in the 2011 publication The World of Special Effects Art Design: Yasuyuki 'Taiko' Inoue (ISBN: 4873763681). The craft is normally called, in Japanese, as the Daimakan (大魔艦). However, the ongoing Toho Special Effects Movie Photo Complete Works card series does give it the longer name of the Venus Daimakan (金星大魔艦). This is an odd choice considering that the craft's home planet is Messiah 13, third planet of Yomi, and there is no indication of their being multiple Daimakans and this one being the "Venus" version. The idea to have the galley-like paddles on the side of the ship be guns came from special effects director Teruyoshi Nakano, having been inspired by watching movies with pirates in them from his youth. This fact is found in Nakano's interview for the special features on Toho's DVD release of The War in Space. The craft's Japanese name, Daimakan (大魔艦), could be roughly translated into English as "Giant Demon Warship".